Let me start off by saying I was surprised I didn’t have to encourage my family to eat this dish. Even though I made lamb recently I was SURE that they would need to be persuaded. Good thing I didn’t put money on it because I was totally wrong. My mom even gladly tried it and raved about how juicy it was. For anyone out there who wants their family to try something new, just know that a delicious smell will wins anyone over! And my god does this recipe smell delicious. 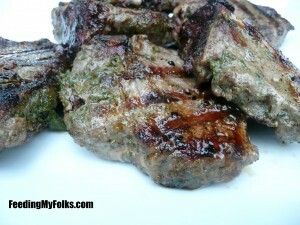 As soon as it hits the grill you instantly get an aroma of garlic, thyme, rosemary, and mint. Not to mention the unmistakable smell of caramelizing meat. 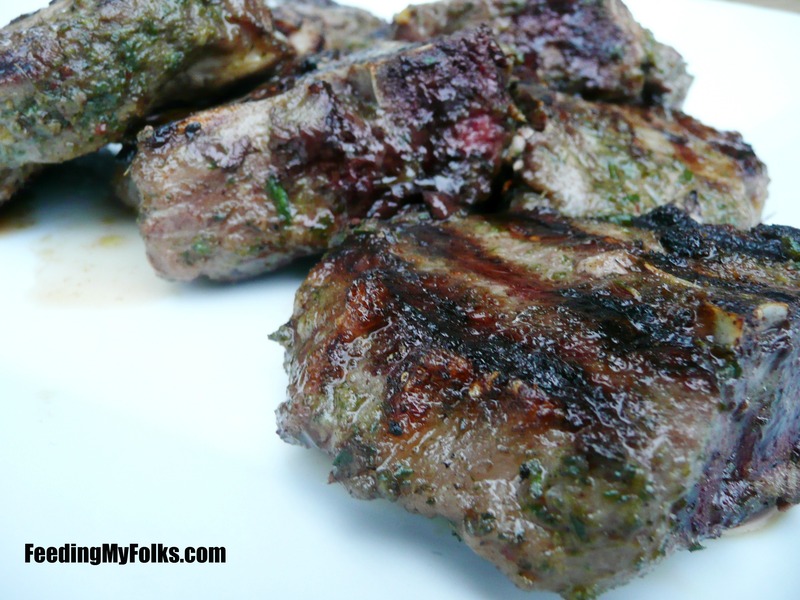 All it takes is maybe 4-5 minutes on each side (depending on how hot your grill is) and a simple herb filled marinade straight from the garden. Yup, I grow all the herbs myself! 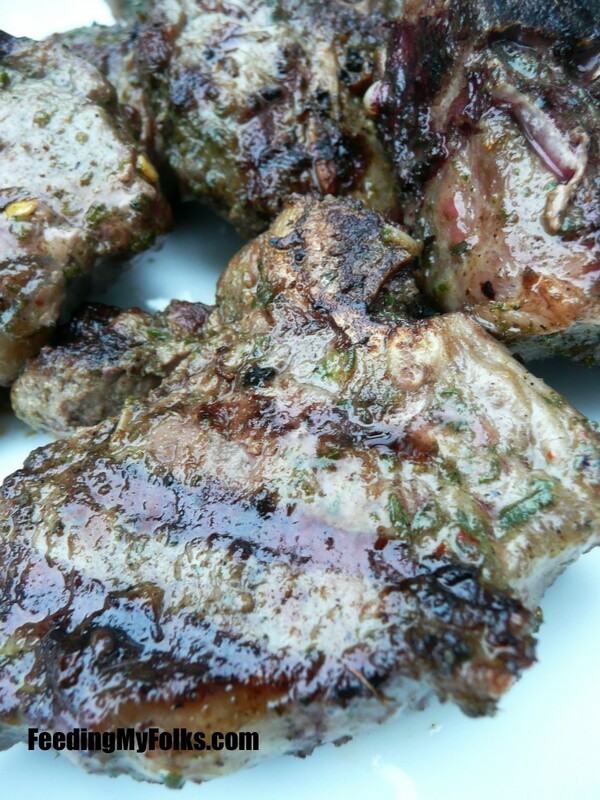 If you don’t grow them at home, don’t worry – you totally will save money on lamb medallions instead of the fancy Frenched ones that look like little meat lollipops. Um, double the price? No thank you!! Save that cash and buy a less expensive cut. The taste is the same in the end…and messy finger food is always fun for a BBQ! So anyway, I made this recipe to compliment a few other dishes during Sunday dinner, but feel free to double it if you’re planning to feed more people. 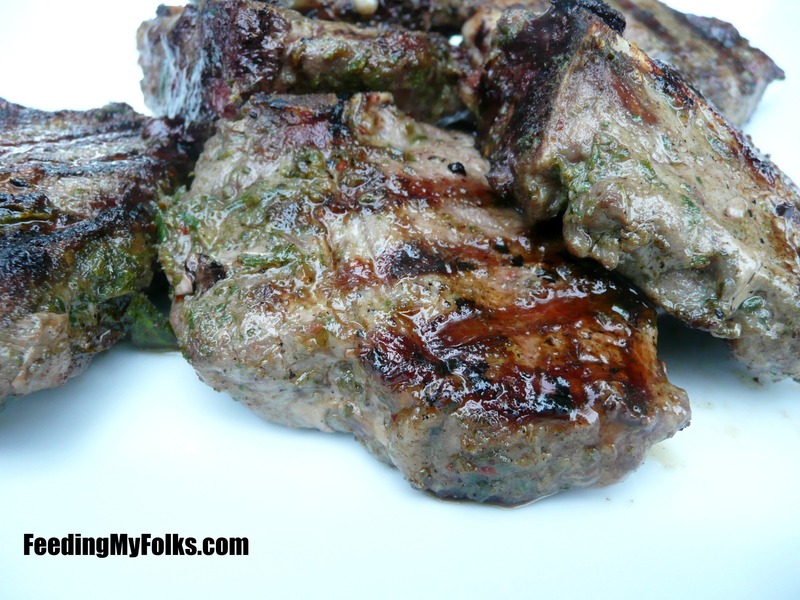 In the end – the family feasted, house smelled wonderful, and I was pleasantly surprised to find out that my family now eats lamb! Win! Put the oil, salt/pepper, red pepper flakes, garlic, mint, thyme, and rosemary into a blender. Blend until smooth. Put the lam into a resealable bag. Pour over marinade. Massage so everything is coated. Put the lamb on the grill and cook for 4-5 minutes for one side and 3-4 on the other (Your grill should be around medium heat). Allow the meat to rest for a few minutes before serving. This looooks so yummy! I’ll have to try it before it gets too cold outside to grill! It could probably work on a counter-top grill too, Hannah! Serve it with a lightly grilled pita and salad. So tasty!